Compensation varies widely and makes it difficult to compare opportunities because it depends on many things, like, whether you become a partner in a small private practice, join a large multi-specialty group or choose hospital employment in a large metropolitan area, small city or rural community. You can see the differences in compensation first hand by using our Physician Salary Calculator. Those variables aside, to know whether your total monetary compensation, as a physician in your specialty, will be fair and competitive, you first need to align your expectations and needs with what the practice requires and provides. 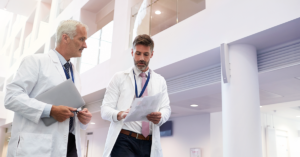 In most practices, a physician’s total work hours are allocated as Billable Clinical, Administrative, and Teaching/Research, according to the Medical Group Management Association which produces industry standard benchmarks. Billable Clinical: This is the time you will spend in direct patient care and consultation, individually or in a team care setting, where a patient bill is generated or a fee-for-service equivalent charge is recorded. It may be defined as hours per day or sessions per week. Administrative: Administrative efforts include medical directorships as well as other administrative duties, such as participating in hospital or clinic initiatives or continuing medical education. Teaching/Research: If the practice includes an academic component, you will also want to know how much of your “teaching time” involves supervising residents where billable patient care is not provided, such as doing research, lecturing or tutoring. You may receive compensation for non-billable activities, but you should first understand what they entail, if they are required and then determine if they are activities you would want to invest time in. Medicine is a 24/7 profession, so it is important to understand what is expected, and what is paid, after hours. 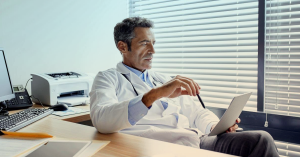 Many innovations have evolved to help physicians address patient needs remotely, including mobile EMRs, nurse-triage services, telemedicine and partnering with hospitalists for after-hours admissions and care for your patients in the hospital. However, all of those services come at a cost. So, it is important to understand how that cost is shared by the physicians, as well as how these services measurably increase your productivity, quality of care and patient satisfaction – all of which will influence your total earnings in our value-based healthcare economy. Balancing (and being paid for) clinical and administrative time is arguably the biggest challenge faced by medical practices and physicians today. Administrative work that proves frustrating and time-consuming is the top source of physician burnout. Before joining a practice, ask probing questions and arrange to shadow physicians and their teams for a week or more, if you can. It will reveal a great deal about how you will actually spend your time. It’s the one thing no one can make more of. Contact us for more information about compensation trends for the location and practice setting you are interested in.